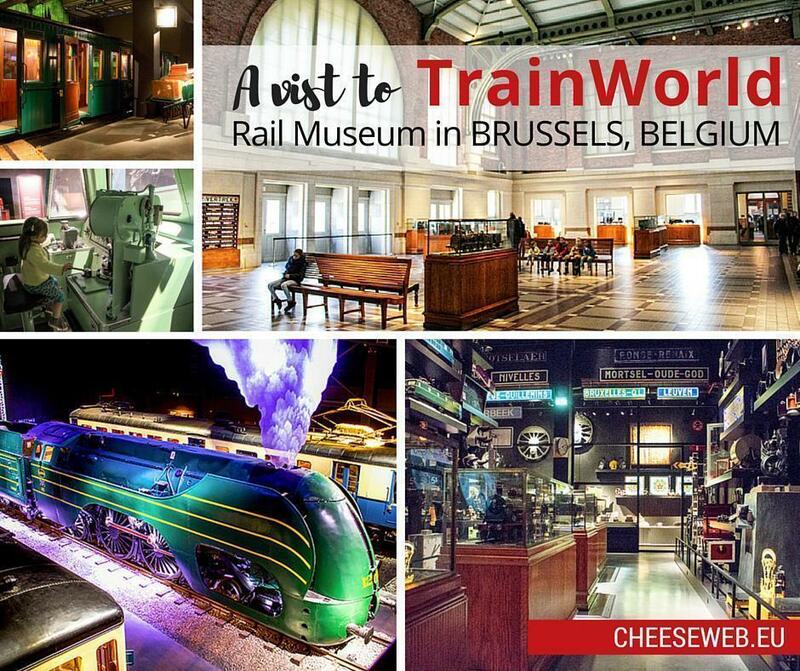 Adrian takes us inside the new Train World Railway Museum in Schaarbeek Station, Brussels; the largest train museum in Belgium. You may know Belgium has not only a dense railway network but also a number of heritage rail lines. Even in 2016, you can ride a historic steam train if you know where to find it. 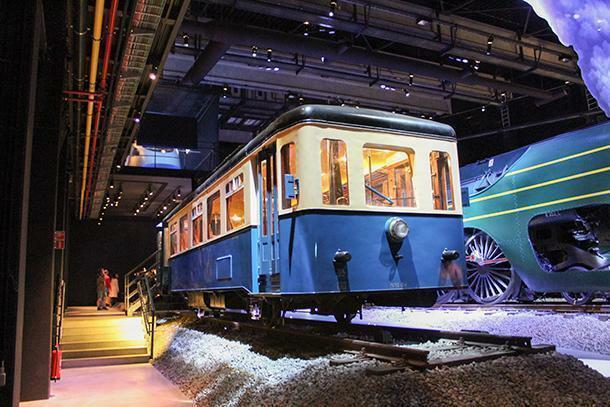 But what about a classy state-of-the-art museum dedicated to the train and its story; a place where old locomotives and railway memorabilia meet contemporary design and interactivity? 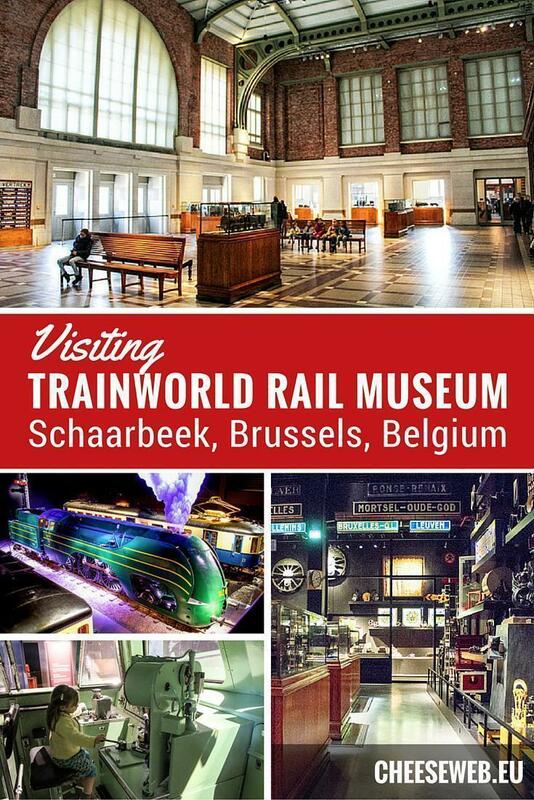 That place is Train World – Belgium’s new railway museum. As a train enthusiast myself, I was impatient to visit. Here is what I found. 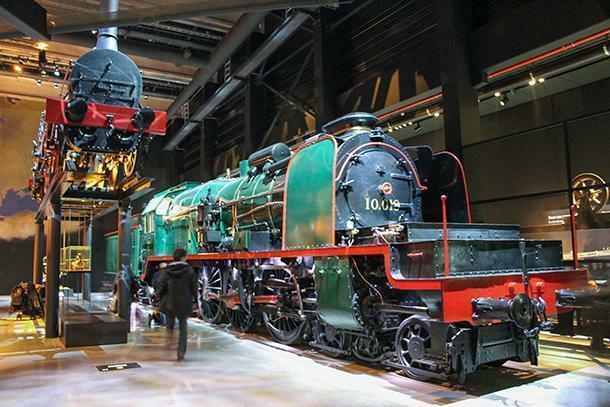 Newly opened in September 2015, Train World is the largest railway museum in Belgium. 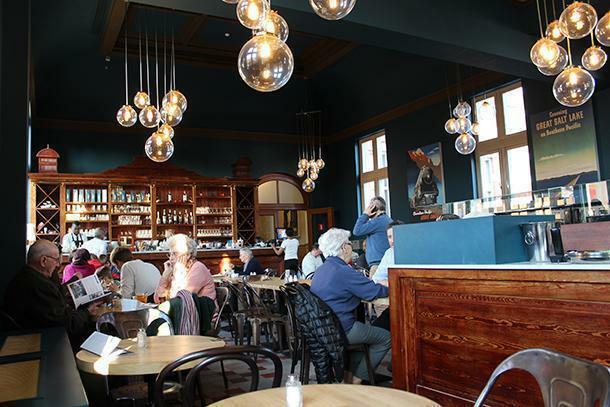 You’ll find it at the most beautiful railway station in the Brussels region – Schaarbeek Station. Train World is more than just a collection of railway vehicles. 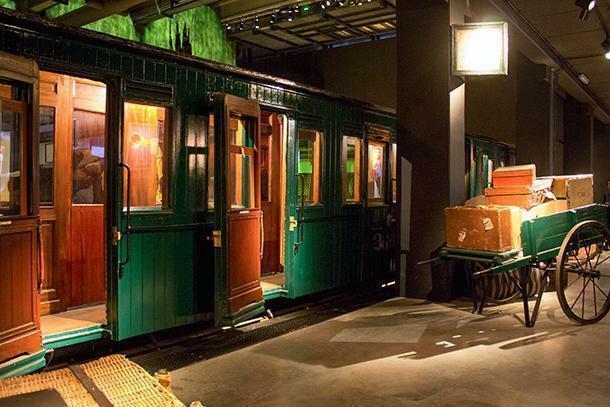 It is an interactive exhibition where you can find information and stories about the development of railways in Belgium and beyond. Of course, you can see some locomotives and carriages, but you can also learn about, the different technologies used for building railways, or the work conditions of railway workers in the past. 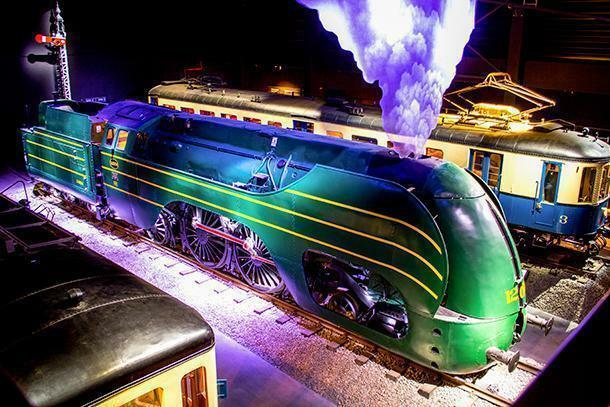 For a touch of originality, Train World is also a show of light, sound, and unusual design, making it an exciting attraction even if you are not an avid train fan. The easiest way to get to Train World is obvious: by train. A number of trains stop at Schaarbeek, so even if the ticket counters are no longer functional (as they are now part of the museum), you can reach the station from virtually any corner of Belgium. 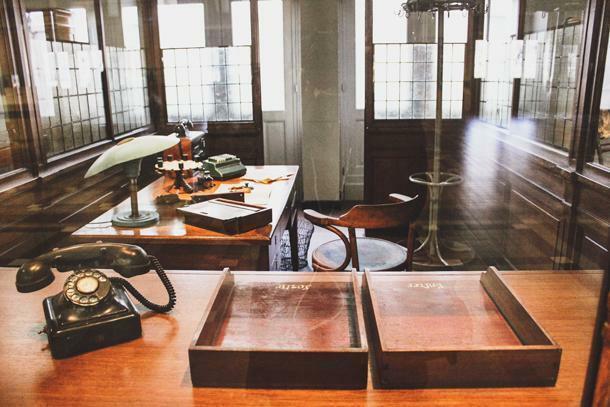 Combined tickets (called B-Excursions) are available from most SNCB stations, providing both the train ticket and entry to the museum for a lower price than if purchased separately. If you live in Brussels however, tram 92, as well as busses 59 and 69 will take you to Princess Elisabeth Square, right in front of Schaarbeek station. How Much does Train World Cost? Train World’s standard admission price is 10€ for an adult or 7.50€ if you qualify for a discount. Children under six can enter for free, and various formulas are available for groups. An audio guide is available for 2€, or you can simply download the museum’s app on your smartphone and have the same recorded content for free. 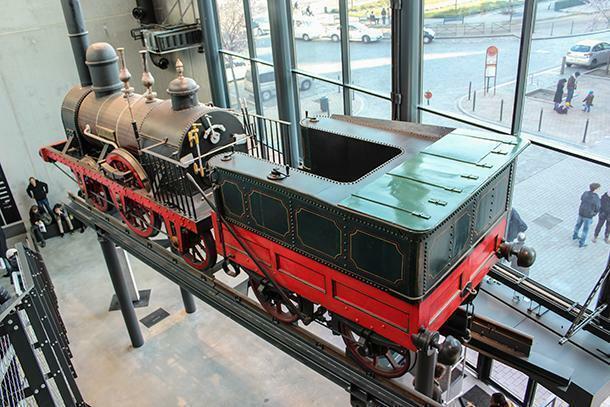 Train World is housed in two buildings: the monumental Schaarbeek train station and a modern building just a few steps to the north-east. The two buildings are linked by an open-air esplanade, where a few historic rail vehicles are on display. 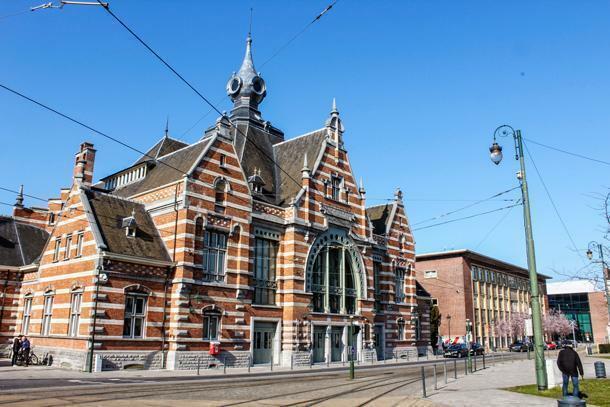 The monumental building of the station, in Flemish Neo-Renaissance style and dating from the turn of the 19th century is the starting point for your visit to Train World. Once you see it, even from the outside, you will regret it doesn’t serve as the Belgian capital’s main train station. Luckily, however, it was classified as a historic monument in 1994 and is now beautifully restored. Inside, the ticket counters look just as they did in the old days, so you can see various ticketing equipment through their windows. Scale models of the most impressive Belgian railway stations are also on display in the salle des pas perdus – I found it particularly interesting to discover and better understand the underground structure of the Brussels-Central station. 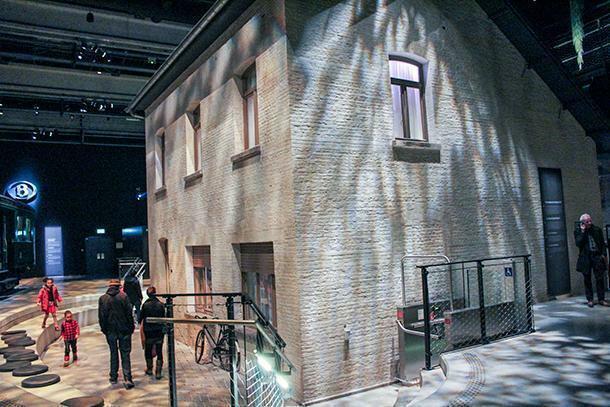 Film projections on the walls show how the train influenced artists and their works. It is important to mention Schaarbeek Station lies on the first railway line ever built on the European continent. Therefore it was with good reason chosen to host the museum. The modern building, actually an industrial hangar, is the most important part of Train World. The most valuable items of the collection are on display here, arranged into four different halls. 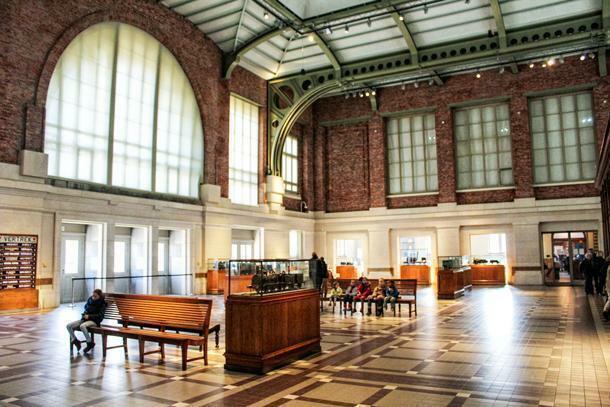 In the first hall, five steam engines welcome visitors. 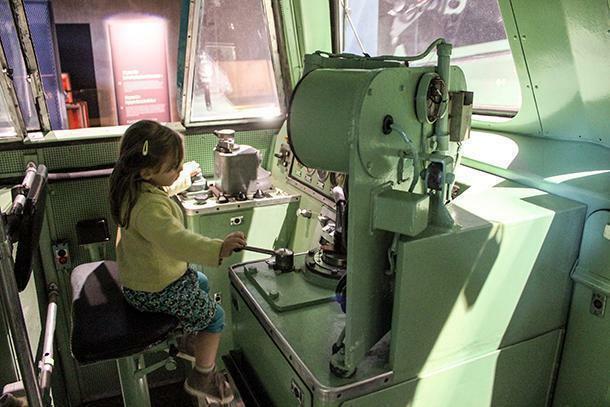 You can even visit the cabin of the Type 10 locomotive and blow the whistle. 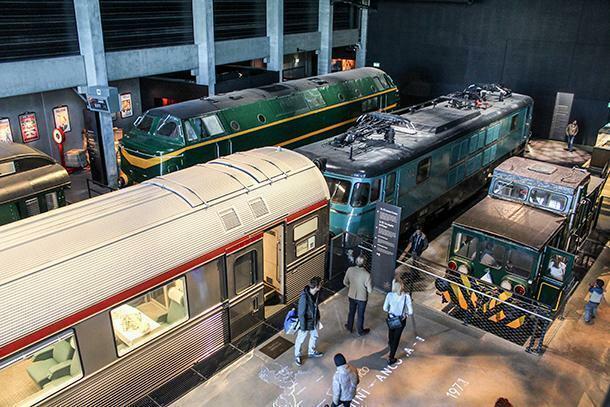 Aside from the locomotives, interactive panels show the evolution of the Belgian railway network, as well as railway construction methods and materials used through different eras. You can also try the different friction forces generated by wheels on rail to understand why they are now made of steel and not wood. 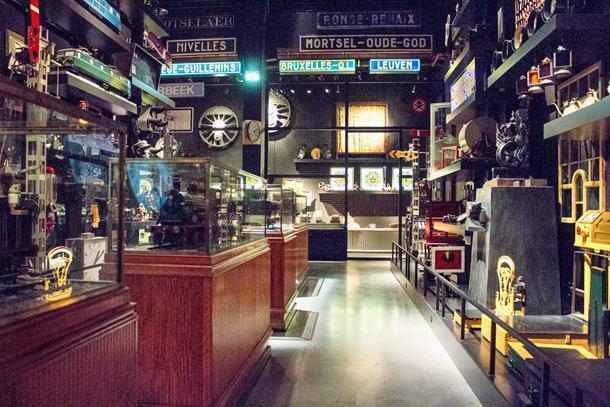 In the same hall, a section symbolically named “the railway attic” displays an important number of objects related to railway history; from signs, tools, and lanterns to scale models and works of art. It’s up to you to take a moment and discover them all. The railway attic. By the way – Bruxelles-Q.L. has changed its name. Do you know what it is now and what the two letters stand for? In the second hall, the three types of traction used in rail transport are displayed: steam, diesel, and electric. A 1939 diesel railcar and the carriage of a 1935 electric multiple unit train shine like new, beside the gorgeous Type 12 steam locomotive. The latter is by far the centrepiece of the museum collection, thanks to her futuristic looks, despite dating back to 1939, and the speed record of 165 km/h she set during tests. 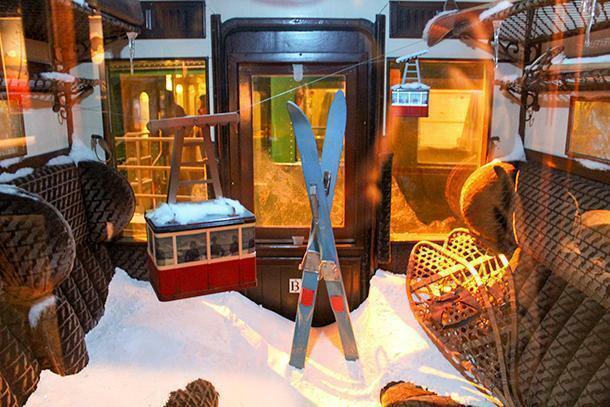 The next hall is dedicated to train carriages, such as the wooden GCI car, with its compartments decorated as holiday landscapes, and the ultramodern (for the time) M1 car, built in the 1930s and boasting a steel structure. 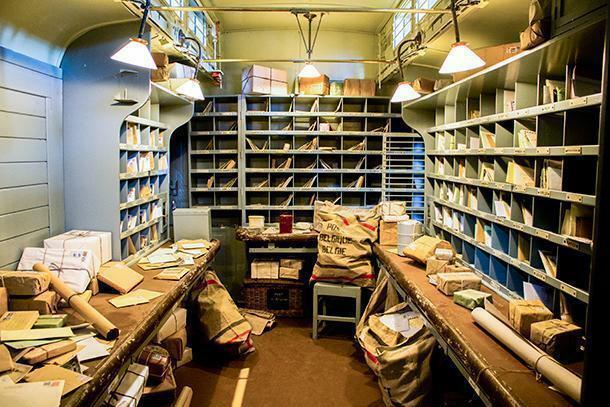 Perhaps the most unexpected item is the authentic railway cottage preserved at its original location, while the whole museum was built around it. You can visit the dining room and have a look in the kitchen. In the fourth and last hall of Train World, a few mythical trains are waiting for you. One is the luxury Trans Europ Express – a predecessor of today’s international high-speed trains like the Thalys or the Eurostar. You can admire a stainless steel coach of the original electric locomotive. Other notable pieces are the two carriages of former royal trains. Quite understandably, access inside them is not permitted, but you can still catch a glimpse through their windows. You do, however, have access to the cockpit of a diesel locomotive from the 60s, and also a mail carriage – another page in railway history that has already turned. Once you finish your visit to the last hall of Train World, you still haven’t finished your visit, because to get back to the exit, you will go upstairs. First, you will walk on a segment of an authentic iron bridge (that once crossed the Meuse at Namur), where two old freight wagons are on display. Then you will follow an elevated path offering a panoramic view of what you have just visited but also some nice bonuses. For instance, you can drive a virtual train to the future in one of the two simulators, or you can watch a presentation video while sitting on an authentic seat from famous trains such as the TGV, the Thalys, the ICE, or even the Japanese bullet train, Shinkansen. Then you will finally reach the souvenir shop, where a replica of La Belge, the first locomotive ever built in Belgium, marks an end to your visit. 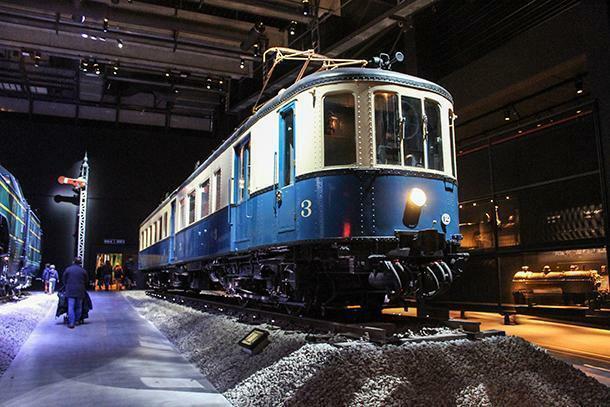 Many more stories await at Train World Belgium; stories about personalities who influenced the development of railways, about artists who were inspired by them, and also dark pages of history such as wartime moments that should never be forgotten. There’s way too much to explain, so if I were you, I would download their app and prepare my visit. I found the Train World app so interesting and useful; I really want to emphasise it here. 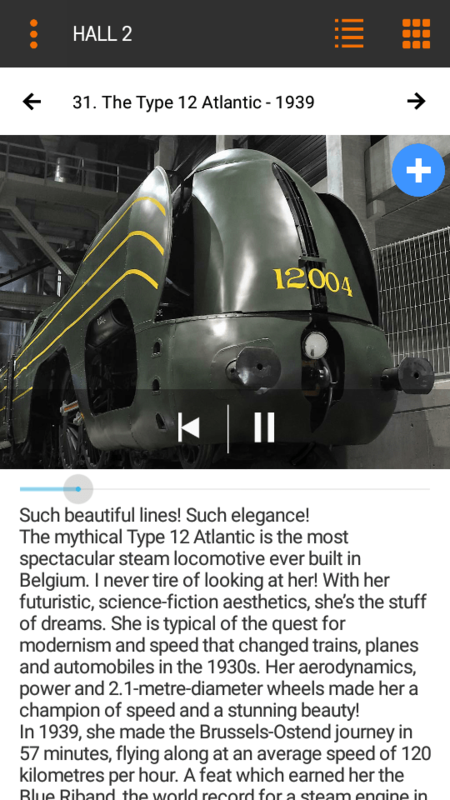 All the content of the audioguide is available for free if you download the Train World app for Android or iOS. This way, you can listen to all the comments related to the items on display in the museum right on your smartphone. Can’t wait until the day you visit Train World? 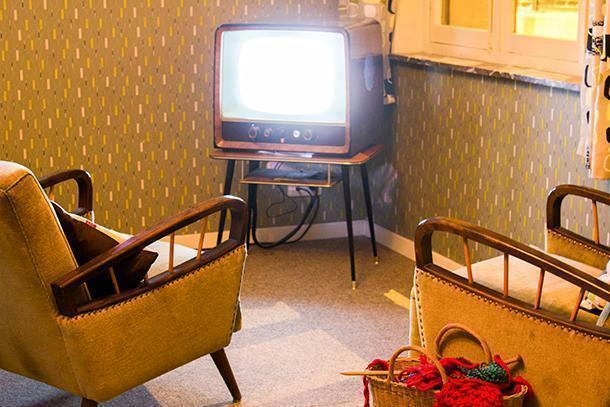 Listen to the comments at home and know what to focus on, once in the museum. Not enough time for a complete (audio)guided visit? Check everything with your eyes and listen to the comments later for a better understanding. Don’t speak either French or Dutch? The app is also available in English and German. You choose how you use it, but one thing is certain: you will need your earphones, so bring them along. Depending on your expectations, this might be good news or bad news: While its innovative design is likely to amaze you, Train World is not a place where you can ride an actual operational train as you would do on heritage railway lines. You can visit the interior of a few vehicles, but you won’t see them work. Train World is mainly about history, discovery, and even scenography, rather than a trip on an old train. No worries, though: even static, your visit to Train World will be captivating enough to keep you busy for at least two hours. Visit Train World on a rainy day. Then, take a sunny day-trip to one of the amazing heritage railway lines of Belgium, for a complete railway experience? I am a Romanian expat in Belgium and I enjoy this country a lot. Since 2007, I got to know it quite well, but I am still discovering it every day. I do it either by train, by bicycle, or simply walking. I take pictures, I make videos, I write... And I enjoy sharing my knowledge with newcomers, so they can have a smoother experience when landing here.